Humans love professional sports. Animals love interrupting professional sports. 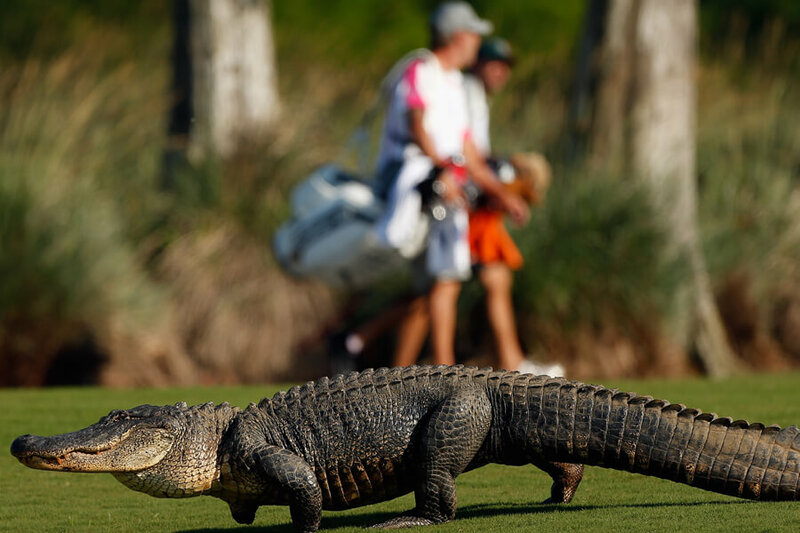 Golf matches reach new levels of intensity when an alligator casually strolls onto the green. Baseball games have to be stopped when dogs decide it’s time to play fetch. Big or small, all animals seem to share the talent for getting on the field in the middle of the action. Here are the best and most adorable animals interrupting professional spots games! You’ll never guess what sea creature braves the land to interrupt golf in Singapore! 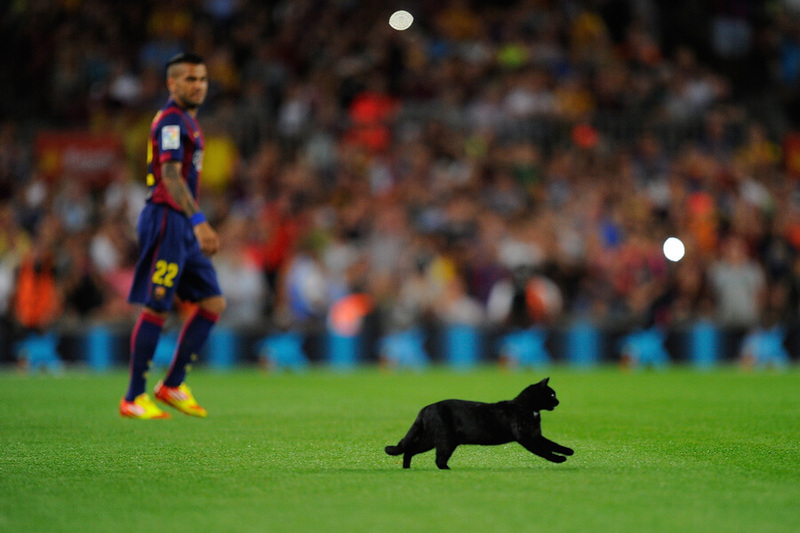 This black cat wants to play soccer with the big kids! Coming out a the start of a 2014 match between FC Barcelona and Elche FC, bad luck struck Elche FC. FC Barcelona crushed Elche FC 3-0 to start the La Liga season. The club was relegated to a lower league at the end of the year. Thanks, cat! Cats on the field is one thing, giraffes on the green is another! Here’s one we never thought we’d see; giraffes taking over a golf course. 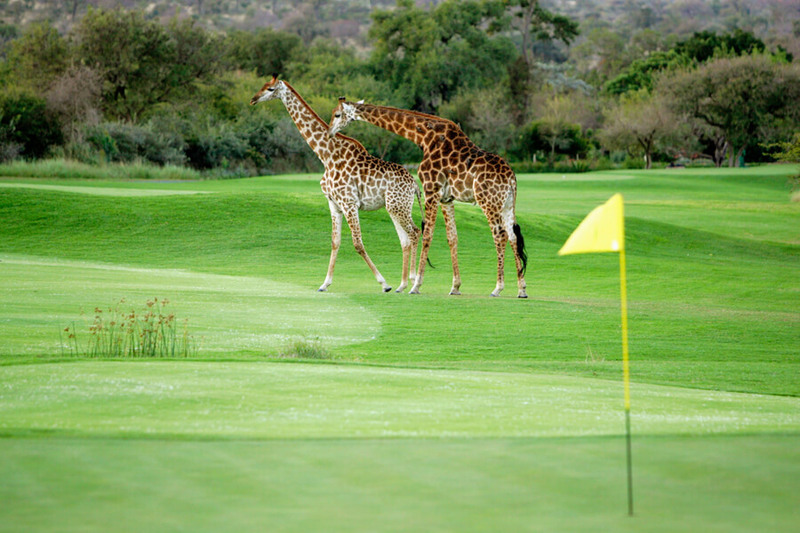 Or is the golf match disrupting a romantic walk for this adorable giraffe couple? This odd photo was taken at the first hole of the Leopard Creek Country Club in South Africa. In South Africa, they might get giraffes interrupting golf matches, but in the United States, a much toothier animal is the culprit. While South Africa has giraffes, the United States has alligators. These behemoths interrupt golf tournaments so much in the states that some athletes putt around them! This scaly fiend was spotted on the 14th fairway during the first round of the Zurich Classic in Louisiana. Billy Horschel won the tournament, but this three-legged alligator won our hearts. 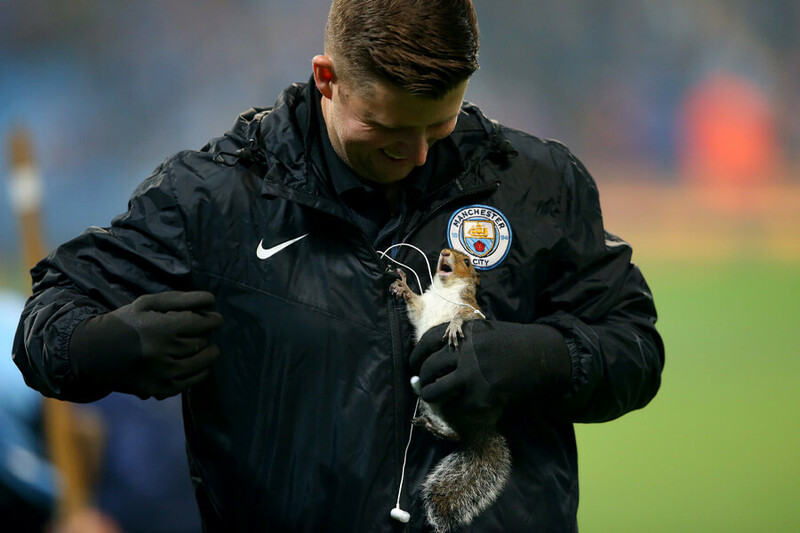 No one is happier about this squirrel interrupting a soccer match then the man who caught it. The squirrel looks pretty happy about the situation, too! The unlikely interruption happened in 2017 during a match between Machester City and Wolverhampton in Machester, England. Once the squirrel was removed safely from the pitch, the game resumed and ended in a 0-0 draw. Next up, an otter running amok on the golf course! 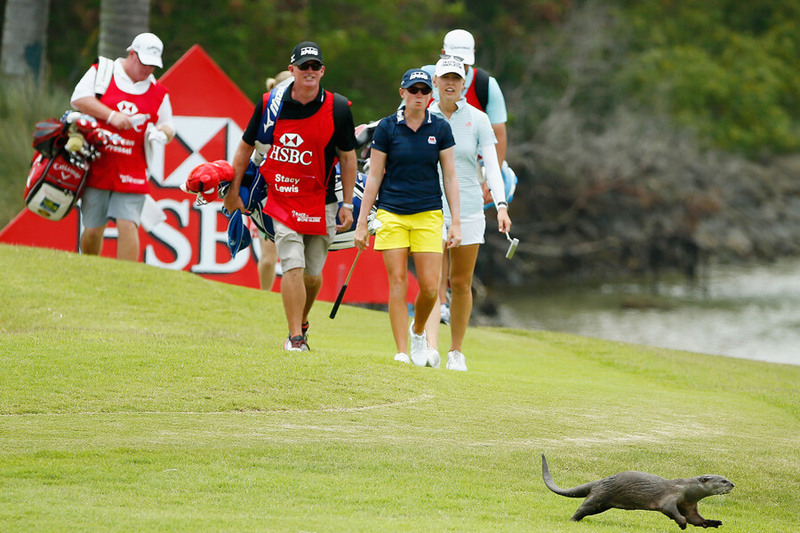 This otter interrupted a golf match in Singapore in 2016. It looks to us like this little guy realized he was in the wrong place at the wrong time pretty quickly. Keep running, you’ll find water soon! The quick appearance and disappearance of the otter were too much for the Americans behind it to handle. South Korean Jang Ha-na won the women’s championship and the $225,000 prize with it! This feisty feline hates soccer. It came on the field with one purpose; end the match. Of course, we can’t say that with certainty, but the stern look this cat has tells us it must be true. 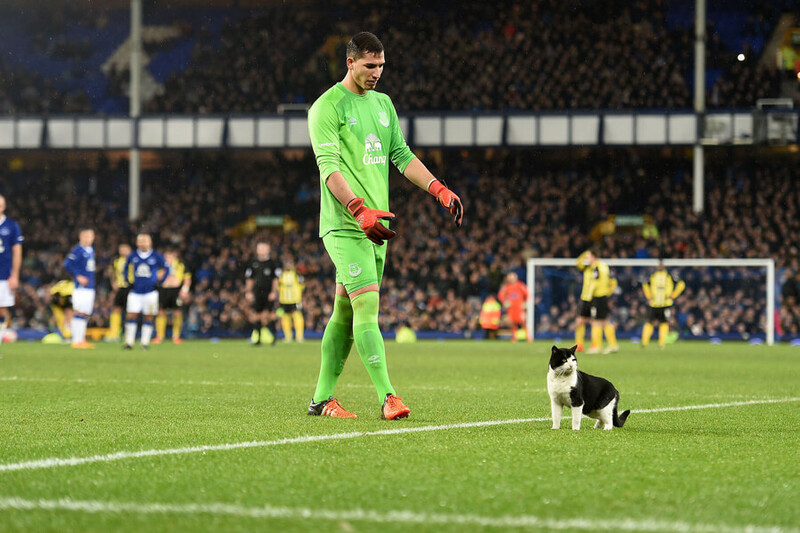 The cat also doesn’t care for the efforts of Everton goalkeeper Joel Robles to get it off the field. 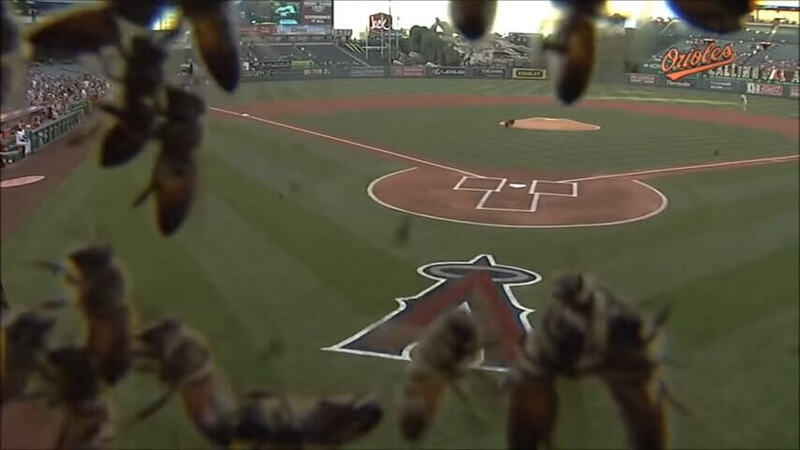 Coming up, what happens when bees take over a baseball stadium! 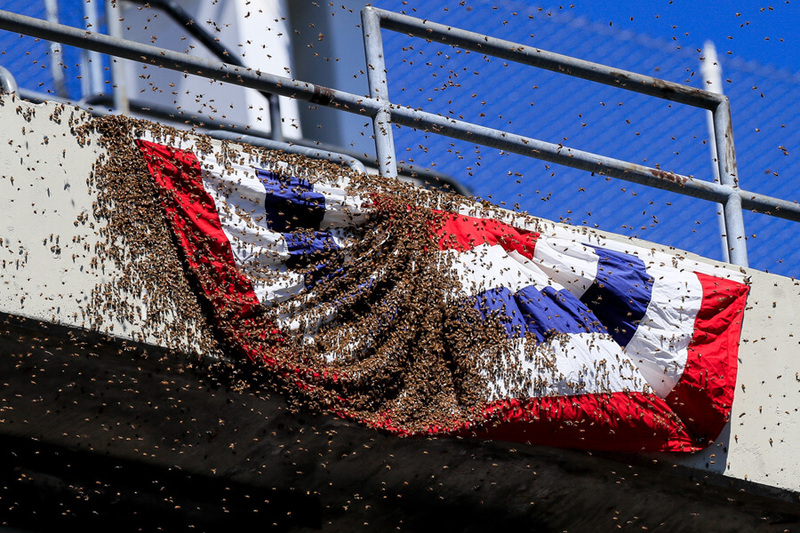 This frightening swarm of bees invaded Kauffman Stadium in 2017, delaying a game between the Kansas City Royals and Cleveland Indians. According to reports zero bees were harmed in their removal. After the incident, Royals manager Ned Yost said, “It’s just important for the environment… in terms of pollination with all the crops.” He’s not wrong, even if the sight of a swarm of bees is terrifying! The Chicago Cubs had to break a lot of curses to win the World Series in 2016. 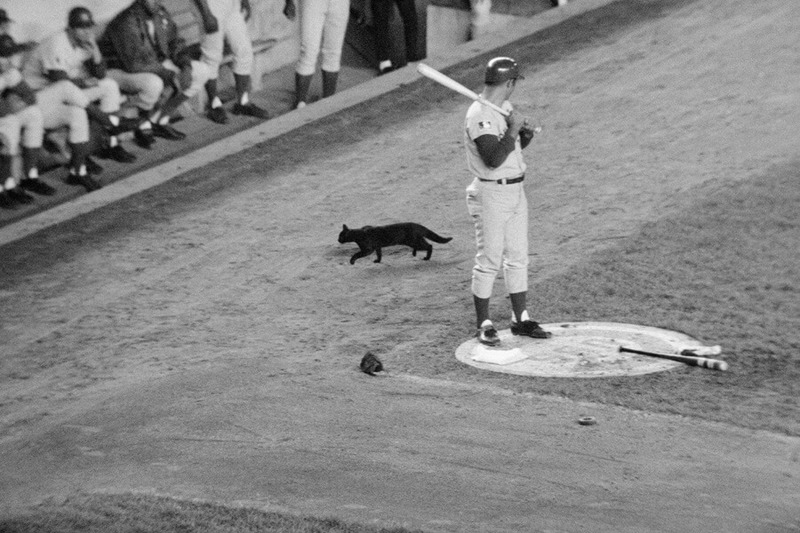 One of those curses was caused by this black cat circling Ron Santo in 1969. Santo was getting ready to take his at-bat in a crucial playoff game. The Cubs went on to lose the game to the New York Mets. They also lost the series to the Mets. New York went on to win the World Series. Keep reading to find out what other animals have stopped golfers in their tracks! In 2011, this praying mantis interrupted a game between the Kansas City Royals and Detroit Tigers. 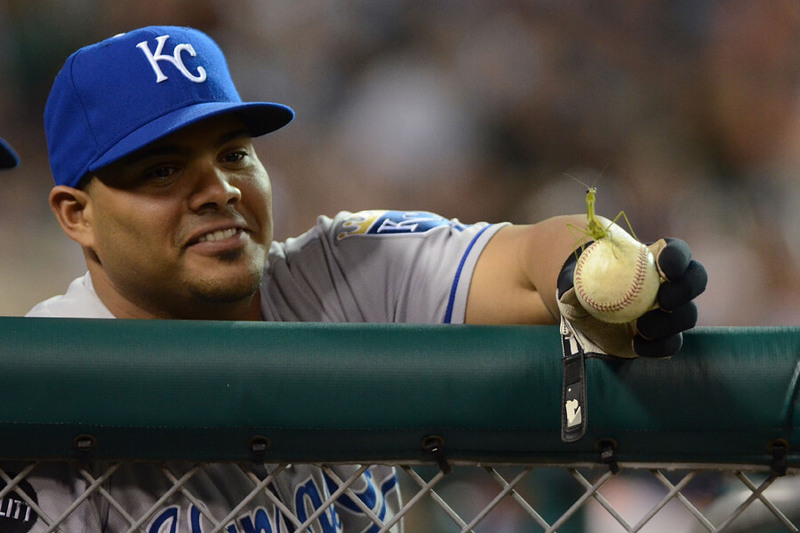 Royals catcher Brayan Pena is seen here holding the mantis at bay on this baseball. Surprisingly, the players were more amused by the insect than scared. At one point a player even let the insect rest on his head. The mantis must have been good luck because the Royals won 9-5. 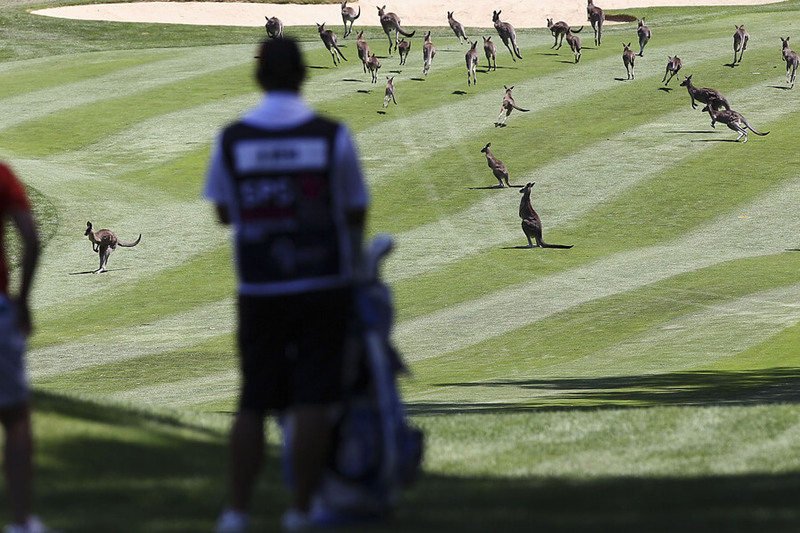 Kangaroos invaded the Australian Open on Valentine’s Day in 2014. Participants had to wait for the troop of kangaroos to leave the fairway before being able to continue the tournament. Once the kangaroos were done having fun, the tournament was able to continue. Jordan Spieth won, shooting eight under 63. Next up, a dog looking to a score a goal! 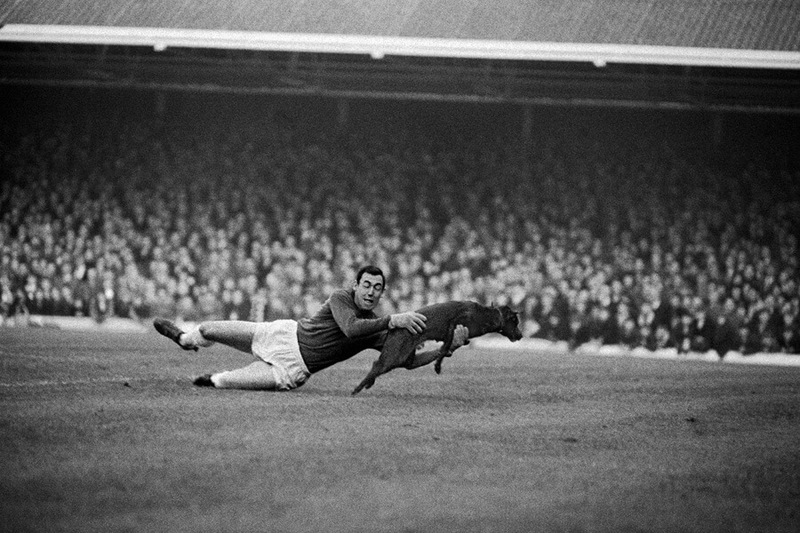 This photo shows Leicester City goalkeeper Gordan Banks “saving” a dog that has run onto the field. From what we know, Manchester United did not score a goal while Banks was distracted. It looks to us like this pup just wanted to play fetch. A soccer ball is probably a little too big for him, though! Stick around to see how soccer players react to squirrels! 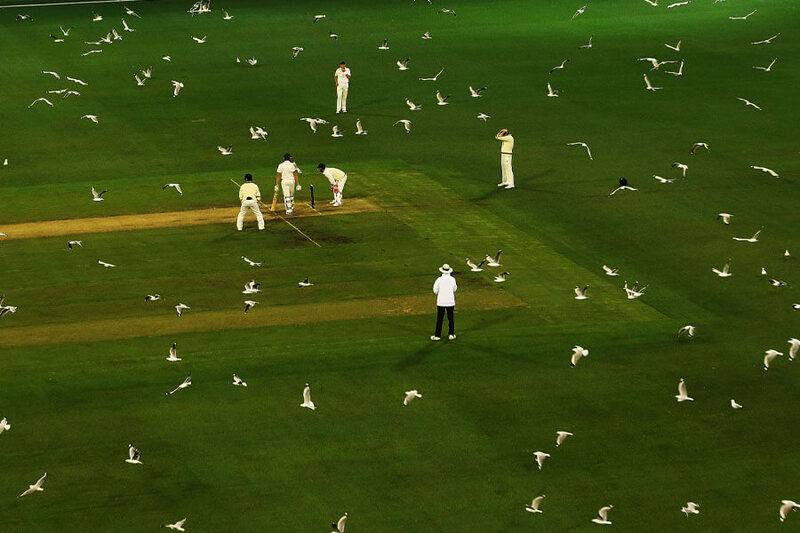 This picture only shows a handful of the hundreds of birds that interrupted a cricket match in Melbourne, Australia. Just like at baseball games, Seagulls can’t wait for the final out to start eating. Tasmania was due up at the plate on day two of the Sheffield Shield match against Victoria. The birds were a bad omen for Tasmania. Victoria won the match and the championship. 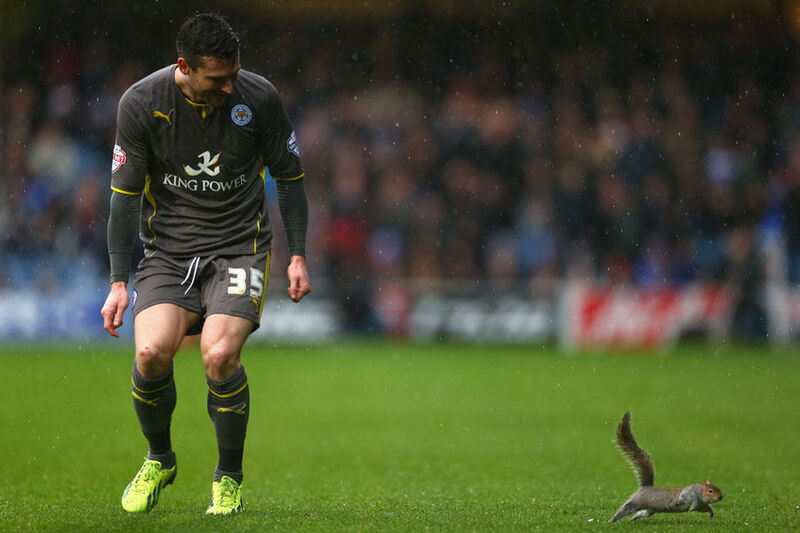 This rascally squirrel delayed the play of a match between Leicester City and Queens Park in 2013. David Nugent doesn’t look too upset about the situation. Tasked with chasing the squirrel from the pitch, he had the best job of the day. It helps that Leicester City won the match 1-0! Animals aren’t always bad omens when they invade sporting events. 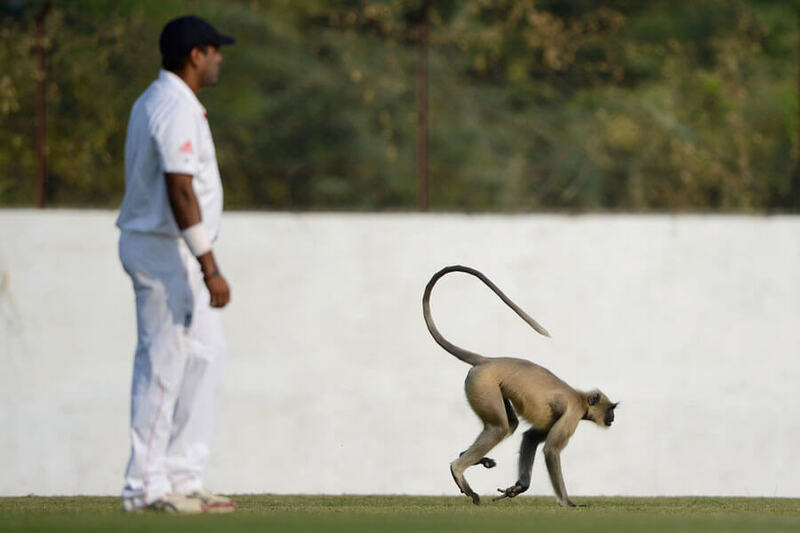 This monkey delayed a cricket match in 2012 between England and Haryana. It was day two of the tour match and the monkey must have thought he was England’s secret weapon. English star Tim Bresnan wasn’t fazed by the interruption, saying, “we get them down at my local cricket club all the time.” Coming up, bees decide they’ve seen enough cricket for one day! Continuing our tour of cricket, bees invaded this match from 2008. To avoid getting stung, everyone laid on the ground and waited for the swarm to pass above. We assume this strategy worked. The match between Australia and India eventually resumed. We don’t know who won the match, but we think it was the bees. Bees never lose at cricket. 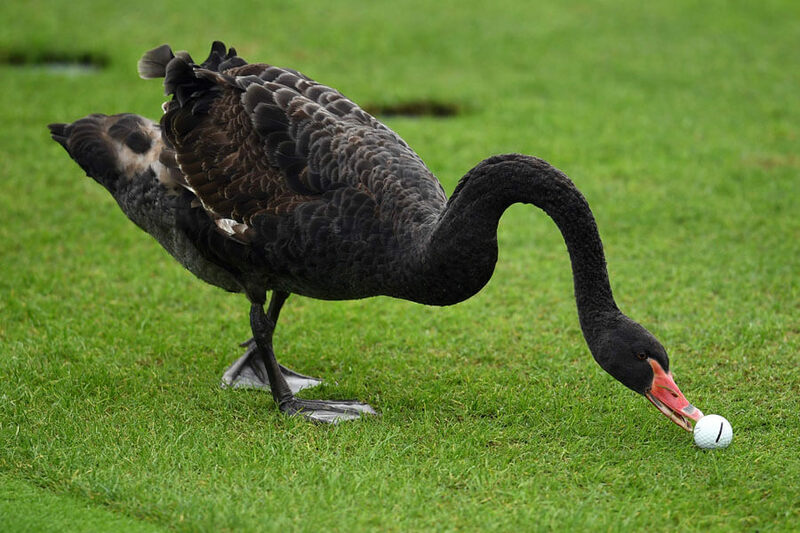 This black swan is giving a new meaning to the term birdie with this bogus play on the ball! Caught in the act in 2016 at the World Golf Championships in Shanghai, we hope Branden Grace got a mulligan. It’s clear to us now that golf is the most interrupted sport by the widest array of animals. You’ll have to stick around to see if any other species make an appearance on the green. We’re not sure what the Mets thought was going to happen when they started “Bark at the Park” in 2016. This incident happened during pre-game warm-ups and not a single player was upset about the distraction. The result of this game doesn’t matter. Look how happy that dog is! And look how happy David Wright is! 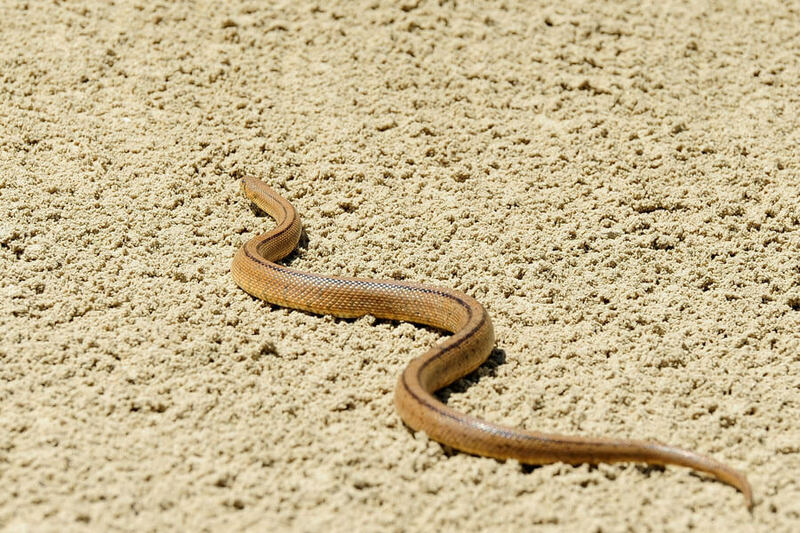 More proof that animals hate golf, this snake was caught waiting in the bunker of the Madrid Masters in 2010. We’re convinced it was up to no good. Are snakes ever up to any good? This snake probably didn’t interrupt the tournament as much as be a minor inconvenience. It doesn’t look big enough to steal a golf ball. Although, we guess it could eat one. 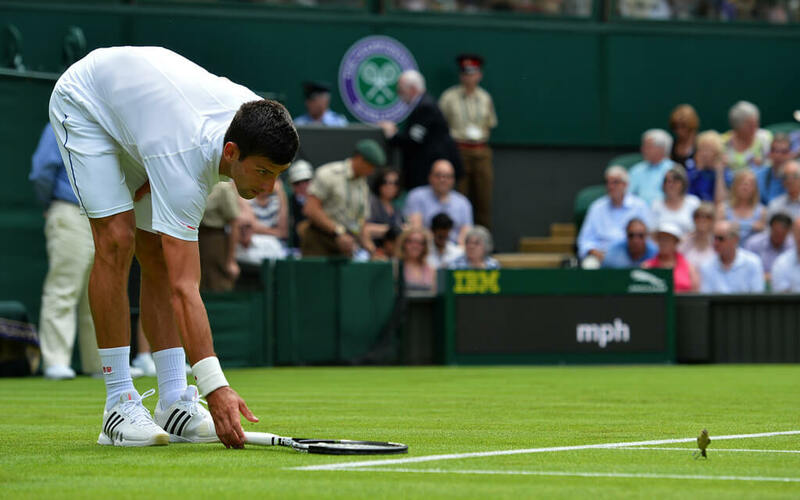 This little birdy got in the way of Novak Djokovic as he tried to take the court in 2015 for his first round match at Wimbledon. He tried his best to kick the tiny invader away, but the bird didn’t care for his tactics. The bird didn’t shake the all-pro at all. Djokovic took first place in men’s singles. It was his third Wimbledon title. This flock of seagulls on the field in Oakland has become so normal that players aren’t phased by the delay. The trick is the birds have learned how long games last and when it’s time for leftover concessions. After three hours waiting, however, the seagulls lose their patience. They take to the field and the movie The Birds becomes a scary reality. 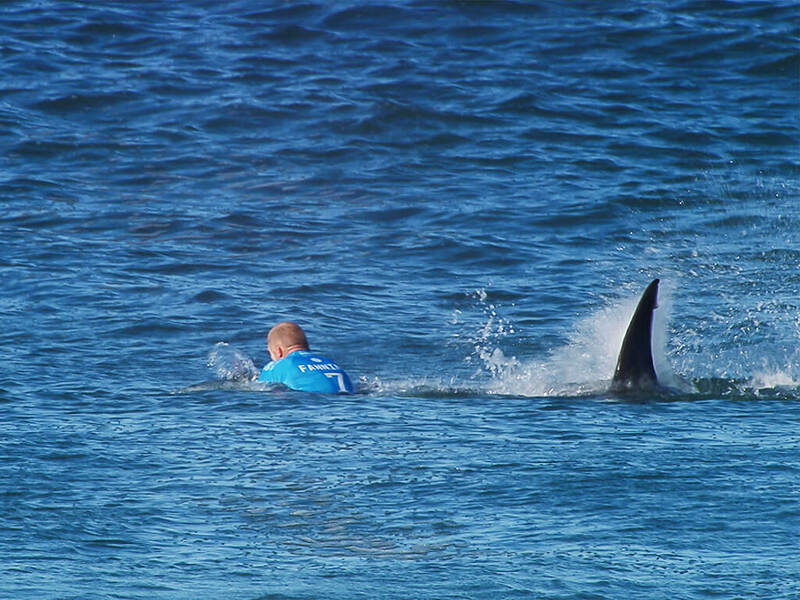 Three-time world champion surfer Mick Fanning was competing at the World Surf League Jeffrey’s Bay event in South Africa when every surfer’s worst nightmare happened. Known to be an area populated with aggressive great white sharks, Fanning was in the water surfing his heat when a shark came up behind him. The shark became tangled in Fanning’s surf leash while the surfer frantically tried to paddle away. Cameras show a giant shark fin right next to Fanning with water splashing all around. After what felt like forever, as fans watched the live stream, jet skis reached the Aussie surfer and pulled him to safety. Umpire Gerry Davis halted a game between the Los Angeles Angels of Anaheim and the St. Louis Cardinals on May 12, 2016. 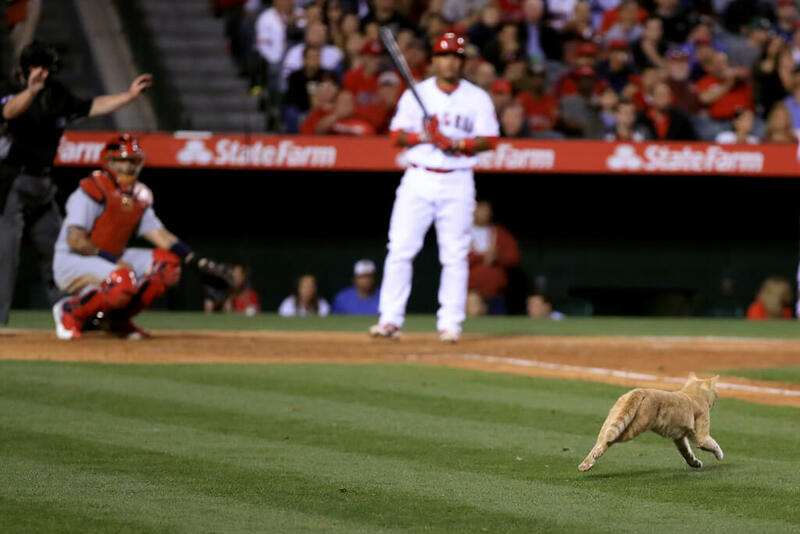 As the Angels’ Carlos Perez stepped to the plate, the game came to a brief halt when a cat was seen on the field at Angel Stadium. The cat was seen scurrying across the bases and into the stands, where he was picked up by a staff member. After the game, the cat was taken to a local adoption agency where he could stay out of the way of any fly balls. 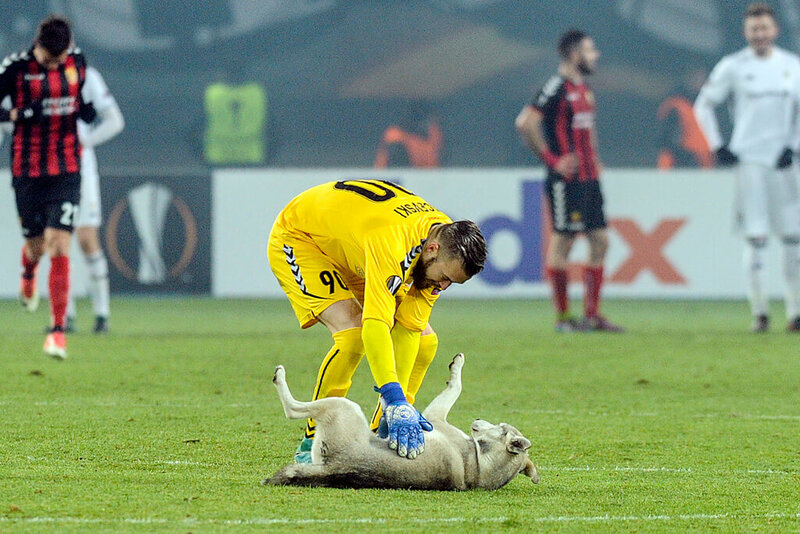 In December 2017, a dog ran onto the pitch of a Europa League football game between Macedonia’s FK Vardar and Norway’s Rosenborg. The game was 1-1 and left at a cliffhanger when the game came to a pause. 73 minutes into the game, a happy husky found its way onto the field. It seemed that this guy wasn’t just passing by either. He seemed to want to play with the football players, who had to wait until security ushered the pup off the pitch. “Go Rabbit Ears! Touchdown!” announced CBS Sports announcer Tim Brando as a jackrabbit ran to the end zone at a college football game between Stanford and Oregon in October 2017. 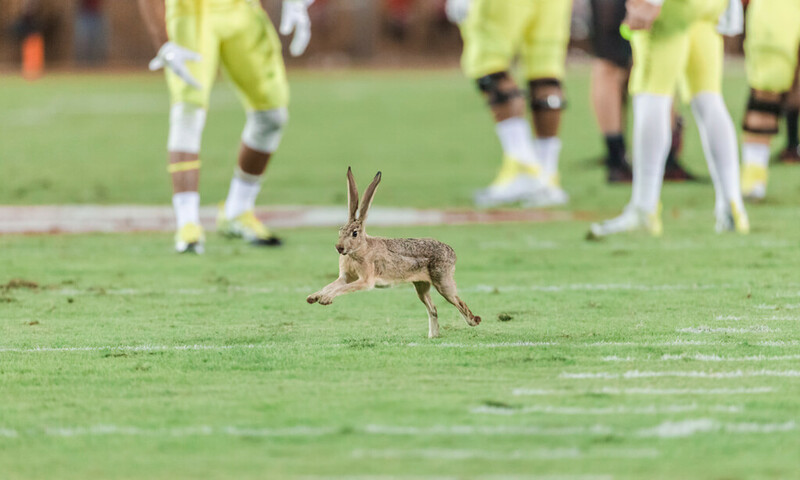 The Stanford crowd cheered on as a jackrabbit ran onto the field and halted the game in the first quarter, but ended up booing after a member from Oregon’s bench staff took the jackrabbit out of play. Stanford went on to win the game 49-7. 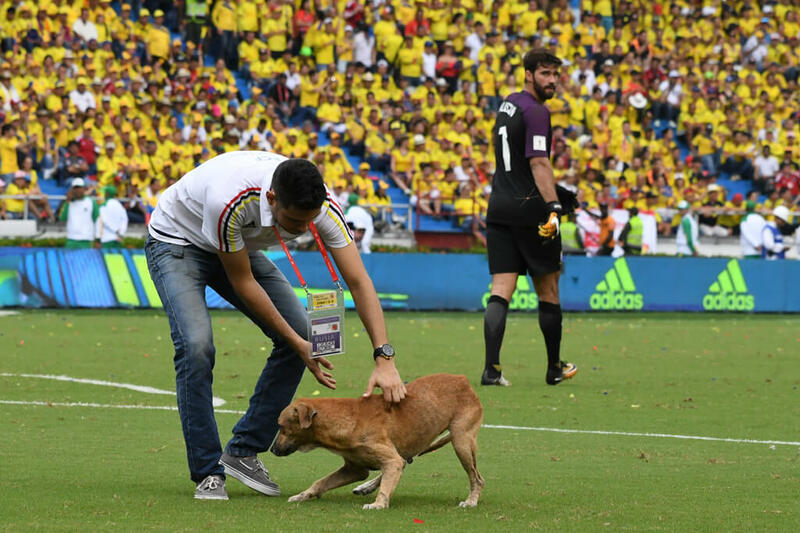 During the 2018 World Cup qualifier between Colombia and Brazil, another dog put a pause to the match when he ran onto the field. He must have seen the ball in play and mistook it for a chance to play with his buddies! The dog entered the match just after halftime in the game that took place in Barranquilla. After the dog was taken care of and the game resumed, both teams ended up settling in a 1-1 draw. Imagine that you’re in hot pursuit of managing first in a motor race when all of a sudden, there’s a kangaroo on the track! That’s exactly what happened back in October 2007 at the Mount Panorama Circuit at the Bathurst 1000. 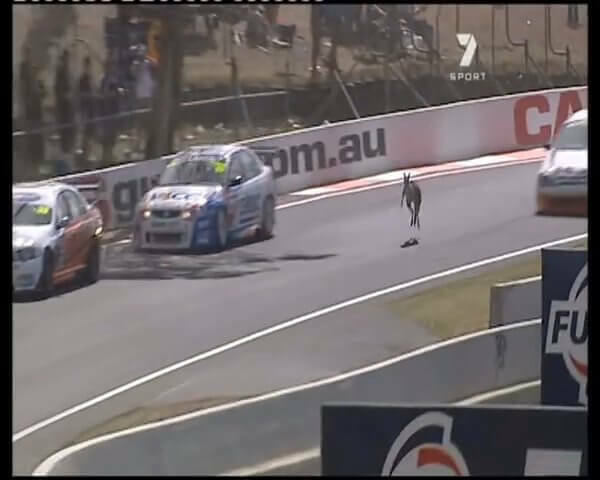 Just as racers were coming around a sharp corner, a kangaroo suddenly began hopping over the track. Luckily, they all narrowly avoided hitting it but some cars did almost end up in a messy crash because of the encounter. Somehow, the kangaroo made it out of that ordeal alive. In a 2017 game between the Kansas City Royals and the St. Louis Cardinals, fans at Busch Stadium were cheering for a new mascot. A kitten that had run onto the field interrupted the sixth inning as Cardinals catcher Yadier Molina took the plate. Before taking his stance, he was pointing at a distraction on the field. 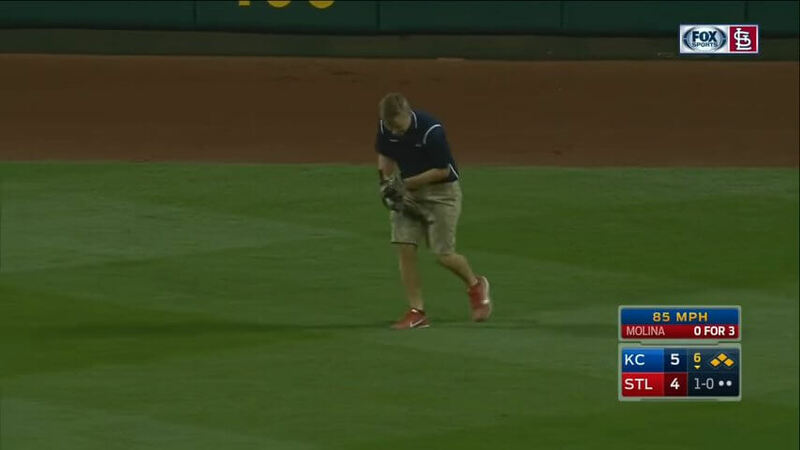 A Busch Stadium grounds crew member managed to scoop up the cat, but it didn’t go over so well. The kitten clawed and bit its way through the whole rescue mission, much to the amusement of everyone present. In a 2009 game between the Cleveland Indians and the Kansas City Royals, a flock of seagulls helped lead the Indians to victory. In the 10th inning, right-fielder Shin-Soo Choo hit a walk-off RBI single that drove straight through the middle of the field. 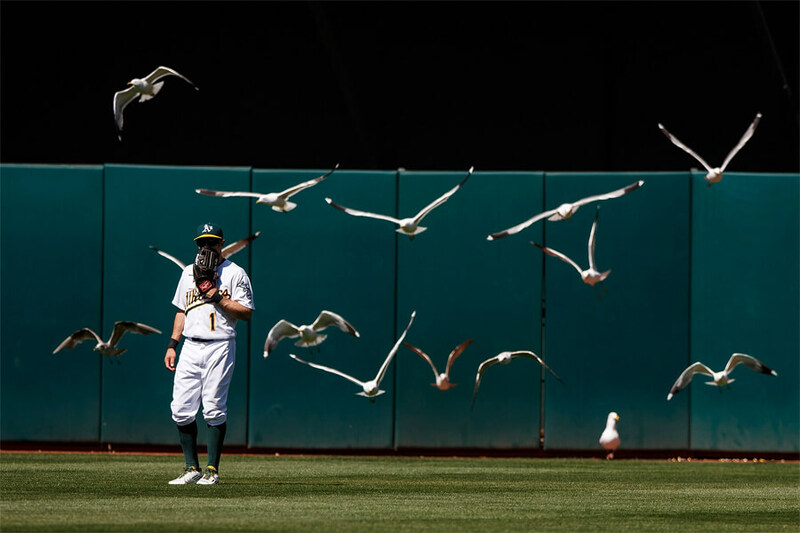 Unfortunately for outfielder Coco Crisp, there was a flock of seagulls that had settled on the field during extra innings. The line drive hit one of the birds and caused them all to take flight at once, which was a huge distraction for Crisp who was unable to catch the ball in time. Flying bugs and animals can be quite a nuisance, especially if you’re trying to win a basketball game. This was the case for a game between the San Antonio Spurs and the Sacramento Kings back in 2009. Apparently, a bat had made its way into AT&T Center and caused many delays. Spurs player Manu Ginobili finally had enough and managed to swat the bat out of the air near the end of the first period. Luckily the bat was taken outside alive, but Ginobili had to undergo a series of painful vaccinations to avoid contracting rabies after touching the bat with bare hands. The Wimbledon Championships in 2015 could not move forward until a tiny bird was safely taken off the court. Serbian tennis player Novak Djokovic spent some time trying to shoo the bird away himself before a ball boy eventually did the honors. Djokovic was in the first round against his opponent, Germany’s Philipp Kohlschreiber at the Centre Court of the All England Tennis Club. Djokovic believed that the bird was a token of good luck and he went on to win the match. The 17th hole at the Tournament Players Club at Sawgrass in Ponte Vedra Beach, Florida is the Achilles heel for many professional golfers. A lot of critics say that it is designed in a way that no one can truly benefit from that hole. This turned out to be especially true in 1998 for Steve Lowery. 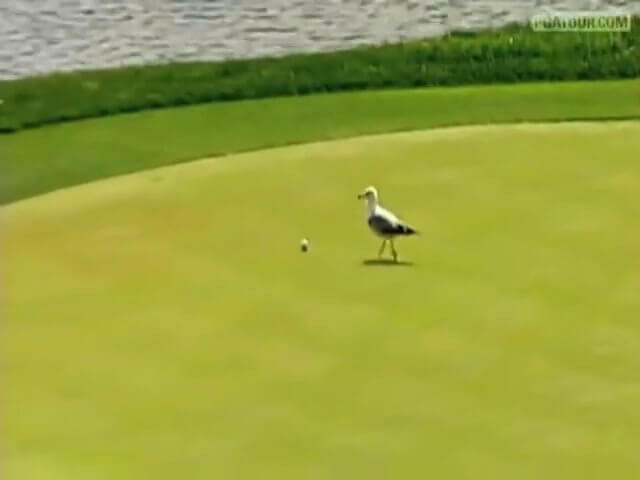 During the 1998 Players Championship, Lowery hit his ball from the tee box only to have it stolen by a seagull who was on the green. The seagull managed to pick up the ball and began flying away before the ball fell in a neighboring water hazard. Back in 2016, races at the Michigan International Speedway were put on hold because a groundhog appeared on the tracks. Many thought they had a squirrel on their hands, but soon realized they were in for something much larger. 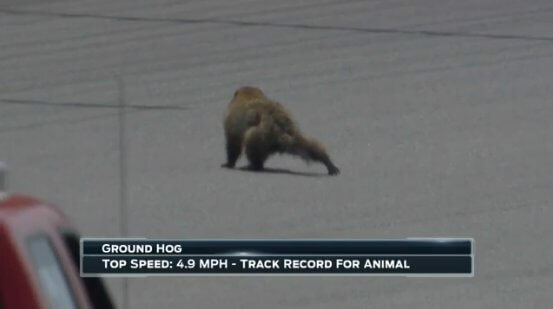 NASCAR officials spent ten minutes chasing the groundhog down while everyone, including the drivers, watched in amusement. After their first success catching the little guy, he leaped out and kept running. They were eventually able to get him off the track and Erik Jones ended up winning the 55-minute session. In 2011, the St. Louis Cardinals adopted a new mascot: and American gray squirrel. 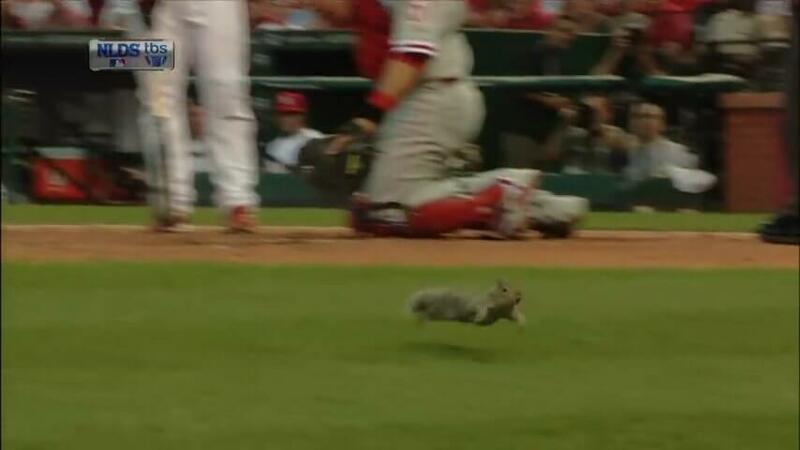 During Game 4 of the National League Division Series in 2011, a squirrel ran through home plate during the fifth inning, just as Phillies’ Roy Oswalt threw out a pitch. The squirrel caused quite a distraction and Oswalt’s pitch was called a ball. It was the second time that a squirrel had caused a distraction during that playoff season. The Cardinals would eventually go on to win the 2011 World Series and they couldn’t have done it without their rally squirrel. 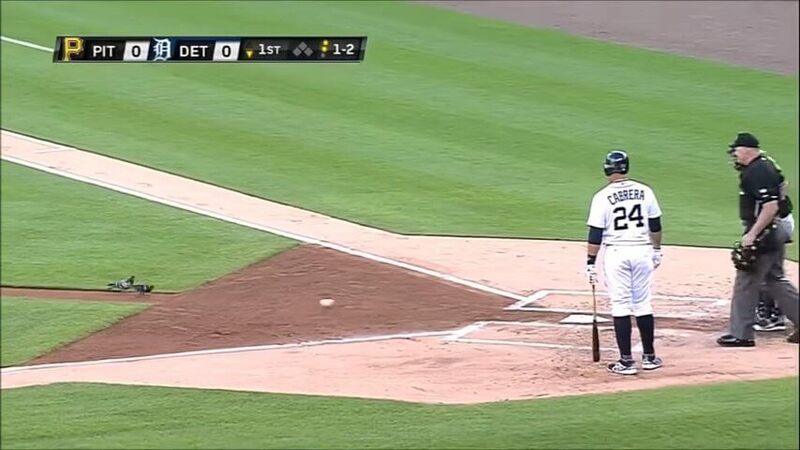 A 2014 game between the Pittsburg Pirates and the Detroit Tigers paused for a brief moment at the start of the game. During the first inning, a pigeon was seen in between the mound and home plate. Pirates pitcher Vince Worley threw out a pitch as usual and the bird didn’t budge. A second pigeon arrived and soon the birds had the full attention of everyone at Detroit’s Comerica Park that day. Worley and Tiger’s first baseman Miguel Cabrera both tried unsuccessfully to move the pigeons out of the way to continue the game. A game between the Baltimore Orioles and the Los Angeles Angels of Anaheim was put on hold back in 2013 because of a bee delay. A bee colony had swarmed the Fox Sports West camera above home plate, causing the start of the game to be postponed. Fortunately, the swarm was contained and removed. The game began as normal, but unfortunately for the Angels, they lost at home. The Orioles ended up winning the game 5-1. During the fourth quarter of a game between the Baltimore Ravens and Miami Dolphins, fans at the M&T Bank Stadium were treated to a little more than just some football. The game itself might have been rather slow to watch since the Ravens were defeating Miami 40-0. 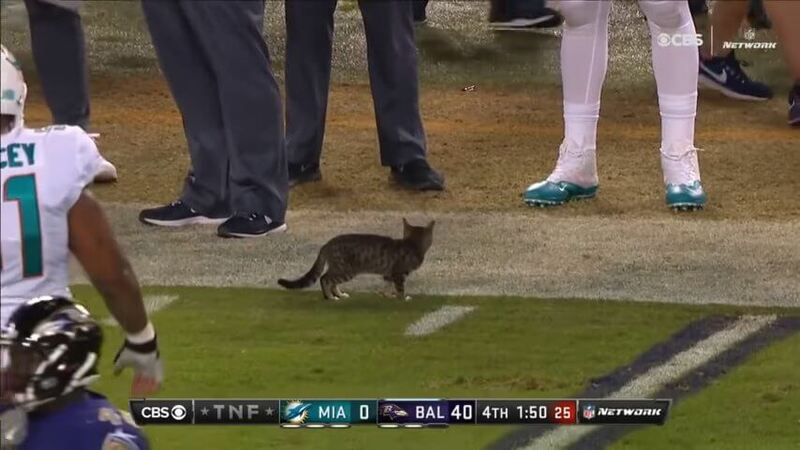 However, excitement picked up towards the end of the game when a cat suddenly appeared on the field. The cat didn’t actually cause any interference and was apprehended. It was adopted by a stadium employee and named Rae. 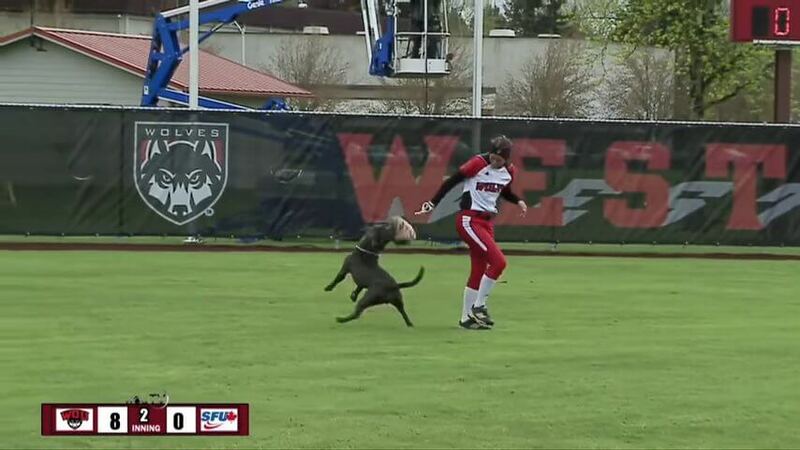 During a softball game between Simon Fraser and Western Oregon, things were all fine until a fan’s excited dog somehow got onto the field. The dog was obviously in for some playtime as he started running around towards the players. He even snatched one of the girl’s gloves off her hand and began playing keep away with it. Eventually, they got the glove back and the dog’s owner took him back. It was quite a surprise for the players, but perhaps a welcome one at that. 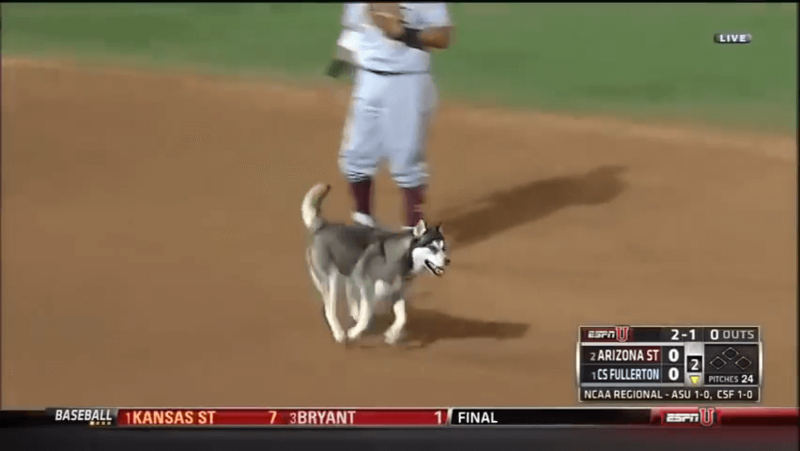 A 2013 NCAA tournament baseball game between Cal State Fullerton and Arizona State University was called to a halt when a husky invaded the field. One of Fullerton’s players at bat called a timeout when he pointed out the canine who was running in from the outfield. 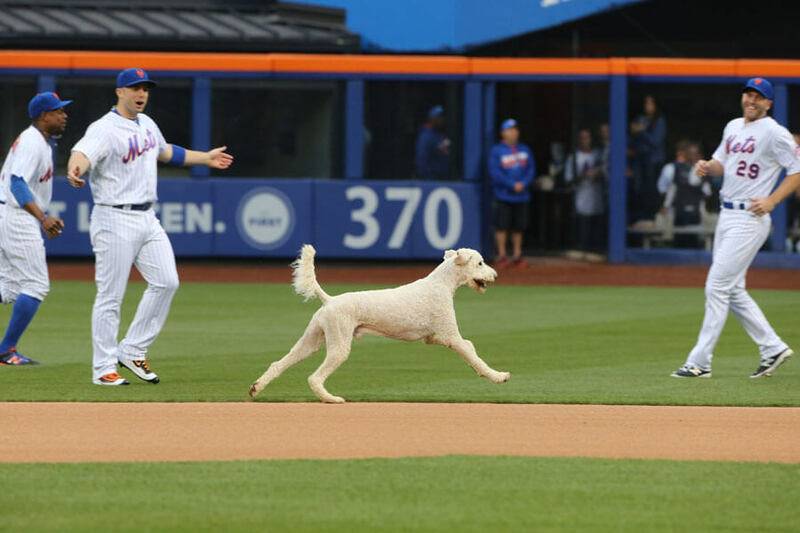 The dog ignored all the players while running around the outfield until he was eventually lured outside of the gate. Needless to say, the fans in the stand were amused by the cute visitor. 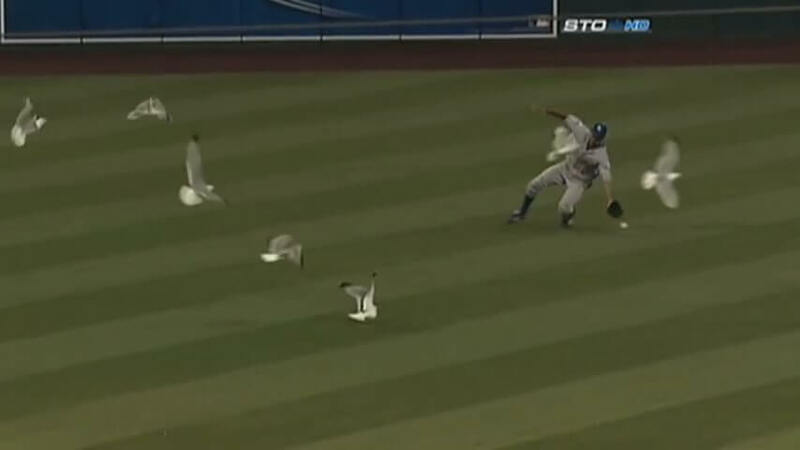 At a Rays and Yankees game in 2015, one of the players was pretty much attacked by a pigeon. New York and Tampa Bay were 3-3 and were already in the 12th inning. The game picked up when centerfielder Kevin Kiermaier hit an RBI single. 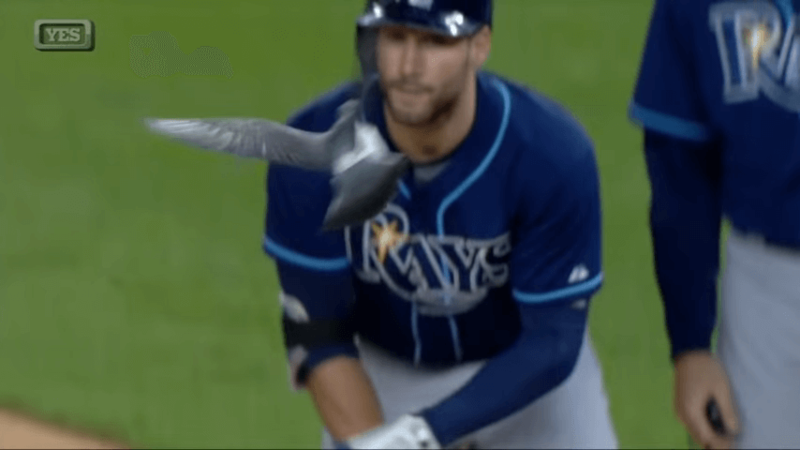 Just as he made it to first, Kiermaier literally came face to face with a pigeon. Perhaps that pigeon was a Yankees fan. Or maybe the pigeon was annoyed that the game had gone on for 12 innings. In 2009, another cat interrupted a game between the Seattle Mariners and the Kansas City Royals. 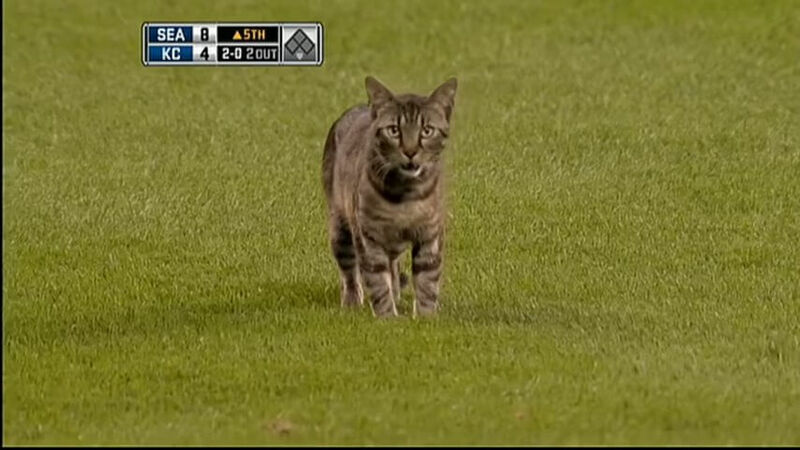 Seattle was winning 8-4 at the top of the fifth when a cat scurried onto the field and caused a huge distraction. As a result, the game was momentarily postponed. Then manager for the Royals Trey Hillman told Associated Press, “I was surprised it wasn’t entirely black,” referencing the popular superstition. At the time, Hillman had achieved the second-worst record in the MLB.